Verona on Valentine’s Day can feel a little cliche. One especially popular way to declare your love is to buy a lock and attach it to the chainlink fence in Juliet’s courtyard, or if you’re feeling in touch with your Banksy side, scrawl a message in Sharpie on the wall outside. But if you’re not up for the touristy stuff – and I can’t blame you, because locks are expensive and Sharpies are selling for 5 euro apiece at Casa di Giulietta – there’s a quieter and more intimate alternative. I’d heard about Letters to Juliet from the eponymous film starring Amanda Seyfried, but when I saw the blurb in the Verona In Love pamphlet encouraging visitors to swing by and pen a letter, I thought for sure I’d misunderstood. Surely it meant that visitors could watch the secretaries, as they’re called, scrawling responses, or that one could take a brief tour of the Juliet Club. Then, two of my students met us in Piazza del Erbe for their check-in, gushing about the experience. “I wrote to a girl who thinks her boyfriend is cheating on her,” explained Mariam. Impressed by the wisdom of the 9th graders – and the fact that they were so excited about something that wasn’t Sephora – I dragged Alex along to see what this epistolary opportunity was all about. The Juliet Club, or Club di Giulietta, is located on Via Sant’Anastasia, a shop-lined street behind Piazza del Erbe. We were greeted by a pleasant woman in her mid-40s who escorted us up a wooden staircase to a narrow corridor that terminated in two small rooms. We were led into the larger of the two rooms, where four teenaged girls sat around a square table, bent into their letters. They smiled at us as we sat down. This “office,” if you can use such an official term for a cozy little room, consisted of bright windows overlooking Verona’s narrow streets and photographs depicting love: two cats rubbing their noses, a veiled woman cradling a single rose. Behind us stood a bookshelf stocked with boxes and baskets overflowing with letters, all categorized by language. There was one box for Spanish, one for Portuguese, and two for English, one labeled “easy” and the other “difficult.” As if that wasn’t enough, a thick binder lay open on the table beside a pad of Juliet Club stationery. Alex and I carefully perused the contents of the binder, looking for a letter we’d each feel comfortable responding to. Initially, it sounds easy enough: give someone love advice. Once you actually spend time reading these letters, though, you start to realize that it isn’t as easy as advising a student to take it slow with the current love of their life. Most letters come from women, aged anywhere from old enough to form sentences to old enough to qualify for pension, and they write about everything from “friendship crushes” to divorce to self-acceptance. Some ask for specific advice while others seem to be written purely for catharsis. Some are typed, some are written by hand. Alex opted for the “difficult” box, while I selected a letter written by a 33-year-old woman from Georgia asking for a sign that loves exists and admitting that by writing, she was hoping to break the curse of being single. Alex wrote to a 31-year-old Polish woman named Paulina whose story was a bit more complicated. Juliet’s secretaries, hard at work. 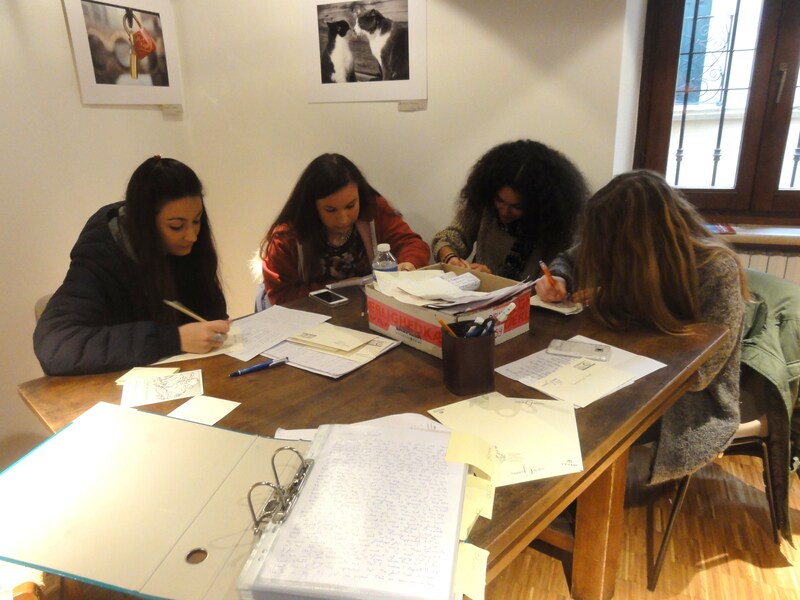 When I’d finished – and it wasn’t easy, figuring out what to write – I asked the girls, who had been volunteering as part of a school project since December, if they ever received letters from men. The man was from England and sought advice about how to find love as an older gentleman who is young at heart. It was a different perspective from the ones we’d been reading, but the message was the same: he felt he had a lot to offer a woman, but couldn’t seem to find the right one. The pile of responses on the table and in the binder were plentiful, and I wondered how many letters got answered on Valentine’s Day as opposed to the other days of the year – and how many never get answered. The Russian basket was looking rather full, I noted with dismay. It’s surprising how emotionally draining it can be, responding to people you don’t know and will never meet, knowing your words may have some lasting impact. I wondered if everyone who wrote expected a response, and how long they would wait for one, and what it is that inspires someone to post their deepest thoughts to a fictional character, to a club staffed, at least at the moment, by four teenage girls. Who did these people expect would answer their letters? How would they feel knowing that advice was being doled out by girls half their age? Ultimately, I decided it felt appropriate that a handful of earnest, teenaged Italian girls were responding. After all, that was Juliet: a passionate, 13-year-old girl, whose “violent delights” may have brought about “violent ends,” but also endowed her with the lasting role as a symbol of true, pure, passionate love. In an e-mail exchange, a friend of mine mentioned that he believes adults will never love as fully as they did as teenagers. I argued that adults can feel love as strongly, and are wiser in love with their years of experience. But I didn’t feel very wise at all, offering advice to the 33-year-old single woman from Georgia. My colleague joked that responding should be simple. I was glad that he’d opted out of joining us. It did raise an interesting point though: handwritten love letters are becoming increasingly obsolete in the digital age where love is just as easily found – if not more easily and more often – in online dating sites, in Facebook, in Tinder. To be surrounded by piles of folded letters and boxes of envelopes bearing stamps from all over the world felt pretty exciting. I wanted to ask her what she’d written, what sage advice she’d given this young girl, but there is something intimate about these letters to strangers that seemed like it needed to be preserved. We exited the building into a gradually increasing rain, and I bought an umbrella. Though the rest of the day was eventful, I couldn’t stop thinking about the small, comfortable rooms, the boxes of hopeful letters, and the four friendly teens who spent their mornings there, penning responses. What a wonderful idea, and what a fitting way to spend a day dedicated to love.